What are the benefits of the Crewed Yacht Charter Business Program? In addition to the significant financial benefits of the program, you can rest assured knowing that your new yacht is in vetted, skilled hands. We provide all aspects of service required for successful execution and operations. Charter Yacht Solutions, Ltd., based in St. Thomas USVI, provides access to a worldwide network of charter brokers. Waypoints®, our affiliate company, offers stress-free marketing support and veteran crewed yacht charter brokers with opportunities available in the Caribbean, the Mediterranean, and New England. You can easily coordinate your own travel plans to take advantage of the best climates and locations based on the time of year. When your yacht is being chartered by guests, a full-time captain is responsible for navigating. Your fully crewed yacht will benefit from being based out of not one, but many destinations. This versatile model allows owners to benefit from multiple charter seasons throughout the year as opposed to one. Which yachts are ideal for the Crewed Yacht Charter Business Program? The breathtaking Alegria 67 and Ipanema 58 are Fountaine Pajot’s flagship yachts and represent the finest hulls from their designers in La Rochelle, France. Alegria 67: The exquisite Alegria 67 is the largest and most impressive member of the Fountaine Pajot family. The first hull was unveiled at the 2018 Cannes Yachting Festival this past September. Various versions will be available including the Owner’s and Lounge versions. The Owner’s version features an outstanding suite that takes advantage of the entirety of one hull. The Lounge version boasts a galley adjacent the passageway, allowing the saloon to be a space exclusively for relaxation and entertaining. With a stunning exterior, seemingly endless relaxation space, and a hot tub option, you’ll never want to step on land again. This highly anticipated flagship model will be available in July 2019. For a glimpse of what to expect you can view recently released footage. Ipanema 58: The stunning Ipanema 58 is a flagship yacht that offers all the pleasures of luxury cruising at sea. She beautifully blends elegance and performance with a 270-square-foot cockpit, numerous lounge and sunbathing areas, and masterfully designed suites. The Maestro version provides an owner’s suite and five cabins, the Lounge version provides an owner’s suite and four cabins, and there is a six cabin option. This past summer, our Annapolis, MD team welcomed an Ipanema 58 named Blue Pepper to our docks after documenting her travels from the factory in France on social media. To see the Ipanema 58 in action view Fountaine Pajot’s exclusive footage. When selecting the perfect yacht for your lifestyle it is imperative to collaborate with knowledgeable and dedicated industry professionals. 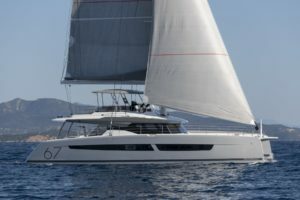 For many years, Atlantic Cruising Yachts has been awarded Best Worldwide Dealer by Fountaine Pajot, demonstrating our expertise in sailing catamarans. 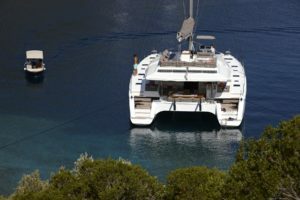 Our strong relationship with Fountaine Pajot allows us to provide our owners with the best possible pricing and committed production slots. Additionally, our team has over 40 years of outfitting and equipping luxury cruising yachts. Our yacht consultants will support you throughout the entire yacht ownership journey and beyond. Our clients often remark about how impressed they are with the high level of support they receive during their journeys: read what else they have to say. Our clients’ satisfaction and happiness is our top priority and as such our team works tirelessly to make your selected yacht perfect down to the smallest details. If you are interested in pursuing the Crewed Yacht Charter Business Program, we would love to speak with you and answer any questions you may have. We have teams in Annapolis, MD, St.Petersburg, FL, and Fort Lauderdale, FL who are ready to help you start your yacht ownership journey. Contact us today!